We are pleased and excited to announce the hiring of Kelley Shirazi in January (I know, a bit belated) to our newly created Director of Sales position. Kelley is responsible for driving our Sales growth through hands-on sales outreach, creating effective sales processes, and refining our sales strategy. Welcome Kelley! Wow what a busy 2018 for Emerald Metrics! The Emerald decision support system provides growers continuous and real time feedback on plant health, existence of harmful molds, fungus and pesticides in addition to effectiveness of lighting and response to fertilizers and other inputs that took weeks before they were detected by the grower. CannaIntelligenceTM is scalable to any size of operation. Now that we have completed our successful raise we are executing our plans for accelerating growth. Our AI is busy learning about plant health. It should be processing clones very shortly. Tetracam has been busy producing the next generation of our exclusive cameras for Cannabis. The results are fantastic! We have lots of other new information that we can share with you if you happen to be visiting the show. Clone Health: Red are unhealthy clones, Green healthy. They all look good to the naked eye. Emerald Metrics knocks it out of the park! Just a couple of hours left to invest! Wow what a busy two months for Emerald Metrics! The Emerald decision support system provides growers continuous and real time feedback on plant health, existence of harmful molds, fungus and pesticides in addition to effectiveness of lighting and response to fertilizers and other inputs that took weeks before they were detected by the grower. The System is scalable to any size of operation. What You See - Looks good! What We See - Red is Mold or Mildew! Securing our first paying customer was just the beginning. In addition to landing Oregon grower Enterprise Farms we have added two customers in Nevada, Shango and Pegasus, one in Oregon at our test facility, KGB Farms, and we are in the process of working out agreements with Cannabis grows in California, Washington, Colorado, and Florida as well as additional growers in Oregon. We now have three provisional patents filed with the USPTO and several more in progress. its flagship SaaS platform CannaIntelligenceTM is now patent pending with the U.S. Patent and Trademark Office. 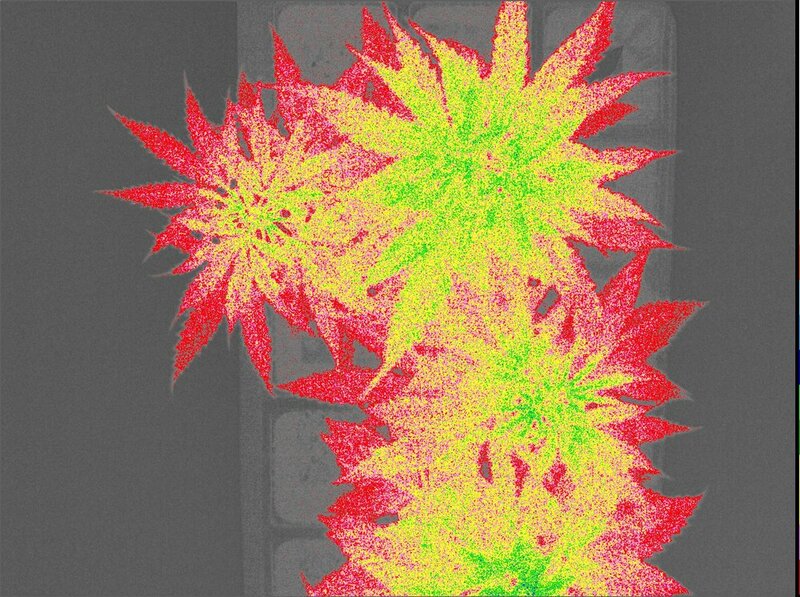 This unique Artificial Intelligence-driven system combines Spectral imagery and sophisticated imagery analysis to protect Cannabis growers and consumers. Plant Health Monitoring and Cannabis and Hemp Operations Financial Calculators are core technologies that we are protecting. Filed in association with the original Emerald Metrics CannaIntelligenceTM “mother” patent, the Plant Health Monitoring filing covers a core technology and process that provides a unique service for the Cannabis industry. Our ability to measure plant health and detect pestilence forms the basis for our precision ag approach to Cannabis growers and derivative manufacturers. The Cannabis and Hemp Financial Operations Calculator brings tried and true agriculture operations management techniques to the rapidly growing Cannabis production arena, professionalizing the financial process and risk management. We have worked out strategic partnerships with EZClone, the leading cloning system provider in North America, our preferred camera provider Tetracam and Cannabis financing company CannaBizFunds. To further enhance our offerings, we have selected a vendor for fixed and mobile mounts for our Tetracam cameras. We are working on a formal agreement with them. Look for an announcement on this in the near future. The Emerald decision support system provides growers continuous and real time feedback on plant health, existence of harmful molds, fungus and pesticides in addition to effectiveness of lighting and response to fertilizers and other inputs that took weeks before they were detected by the grower. The System scales to any size of operation. This is Mark Garrison, Founder of Emerald Metrics. Did you know the North America legal cannabis market is estimated to be over $20b by 2021? In case you weren't aware, our campaign ends soon and I am so thankful you've chosen to join our growing cannabis technology company. We have a strong team with years of experience in agriculture technology. We previously developed and launched a precision platform for a large US Fortune 100 agriculture company. With this success in mainstream agriculture developing, we are ready to show the effectiveness of the Emerald technology in the cannabis industry. Emerald has made some significant advances in our business plan since we launched the campaign. We've signed contracts with growers in Oregon and Nevada. We have signed a MOU with CannaBizFunds to finance the cost of the Emerald system for growers and investors. Our flagship SaaS platform CannaIntelligenceTM is now patent pending with the U.S. Patent and Trademark Office. And there's so much more to come! With the funds raised, we hope to extend our SaaS platform to automate the imagery processing and detection of pestilence. This will allow us to scale faster while significantly lowering our costs. We are already successfully funded- in fact our campaign is over 180% funded. There's still room to invest- we'd appreciate it if you spread the word about the campaign via this link: https://www.seedinvest.com/emerald.metrics/seed. Thank you again for investing in us as we work towards our mission of growing faster, smarter, better cannabis. Version 2 of the Emerald Metrics SaaS released! Invest in Emerald before it is too late! What was that sound? It was loud applause coming from the Emerald Metrics offices during the release of Version 2 of the CannaIntelligence SaaS platform. Rebuilt from the ground up, this version takes advantage of the latest Artificial Intelligence and Internet of Things technologies. The company revamped grow room setup and assignment (making it easier to add new customers and provide them with private & secure dashboards), improved the security platform, updated its artificial intelligence, boosted data support for cameras & sensors, and updated the interface (among other updates). This business update is one of many the company has achieved over the past few weeks. Look for more announcements as Emerald expands through the West Coast and starts to look East. Portland, Oregon, March 9, 2018–Emerald Metrics LLC announced today that its flagship SaaS platform CannaIntelligenceTM is now patent pending with the U.S. Patent and Trademark Office. This unique Artificial Intelligence-driven system combines Spectral imagery and sophisticated imagery analysis to protect Cannabis growers and consumers. The CannaIntelligenceTM platform provides Cannabis growers with sophisticated hyperspectral tools to identify problems with their crops. With the AI discovering issues before the naked eye can see them allows growers to address problems before extensive crop damage occurs resulting in improved yield and product quality. This scientific approach revolutionizes Cannabis industry crop management. These benefits extend to protections for the end user who depend on products that are mold and pesticide free, as well as insurance companies, testing labs, and processing centers. The system is patterned from a project the team launched in 2016 for the largest corn, wheat and soybean growers in the US that helped growers manage their fields like never before. That knowledge has been adapted to Cannabis with startling results identifying harmful fungus, molds and pesticides with the goal of protecting consumers and fundamentally change the way producers grow Cannabis. The Emerald system uses cutting edge spectral imaging technology to enable growers to manage their crop in ways never before done enabling growers to grow faster – better – smarter protecting consumers from harmful contamination. This information will be used to refine and develop new growing standards for producers that will also help protect the consumer and Cannabis supply chain. Emerald Metrics is proud to announce a strategic partnership with Shango Nevada. Shango is a vertically integrated, 70K square foot cannabis growing, processing, and retail facility located in the heart of Las Vegas. The company also has growing and retail locations throughout Oregon. This partnership will allow Emerald Metrics to place its spectral imaging cameras in the Shango facility to ensure that only the healthiest of clones continue through a full growth cycle, thus increasing yield and consistency of the cannabis product. Shango will also use these cameras and proprietary algorithms to prevent foreign substances on employees from contaminating the facility. "We are in the process of developing algorithms and protocols related to the control of pathogens, pests, and other biologics that potentially enter the facility on the clothing of employees," says Rob McCorkle, Co-Founder. "We see the addition of employee monitoring as a much needed option within the industry and are proud to be partnering with a highly respected entity like Shango to roll out this new technology." Emerald Metrics' agreement with Shango represents a step forward in developing new cannabis technology as well as penetrating the Nevada cannabis market.